So my current little pet project is a gift. My boss retires at the end of the month and I wanted to give her a little something. She is another crafter so I know it will be appreciated, and I wanted to do something knit as she can crochet her own stuff that she wants. I haven’t done stranded work before, and had some Fyberspates Scrumptious yarn left over from the Foolproof cowl I made and this little project appealed. 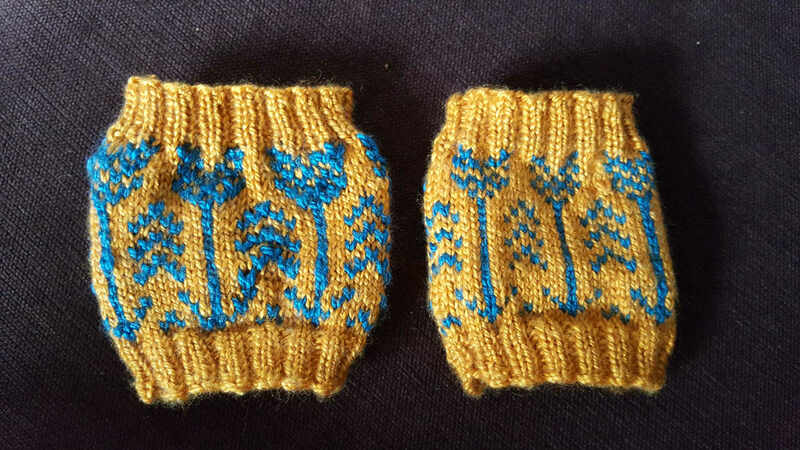 The first cuff I did is the one on the right. Once finished I discovered that I can get it over my relatively small knuckles and thumb. Just. It’s snug. However as a gift there’s a worry that you might damage them taking them on and off so I needed to have a looser tension for the second cuff. That would be the one on the left. Erm. Ah. hopefully the tension will match ONE of the exisiting cuffs. Either one will do! Who invented 1.5mm needles anyway? A very quick update my lovely reader. I’ve been furiously making little crochet flowers for a ‘secret’ project for my family Christmas (which is in February this year, all families have their little foibles don’t they?) so I can’t show you those. I’ve also been working on my ‘desk drawer’ project. Due to the fact I cycle to work I don’t want to carry more than I have to, so I have a project I leave in work so I always have something to work on at lunchtime as the mood strikes me. 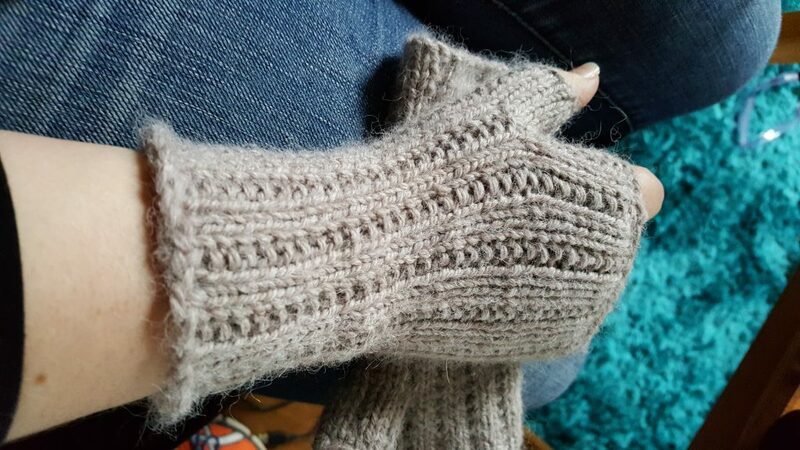 My current ‘desk drawer’ project is the Norweign Mittens. 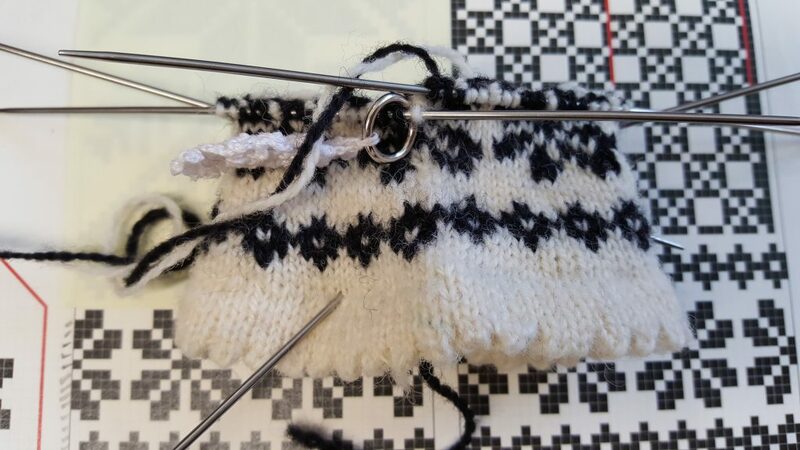 I did work out that if I do two rows *every* lunch time, I’ll be finished the first glove (but not the thumb) in 8 weeks! What possessed me to do my first stranded project on tiny needles in the round I’m still at a loss to explain, however it is fun doing my first stranded project and I’m slowly learning the best ways to hold the two strands of yarn so I don’t end up with a knotted mess after each session. 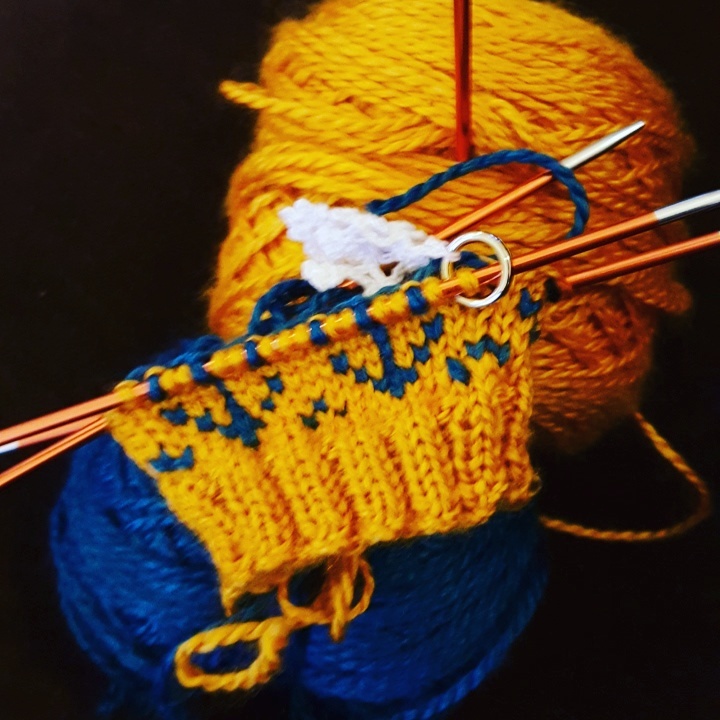 Today I am hoping to pull out the yarn stash and start the ‘longer-than-today’ task of sorting it into something a bit more organised. I currently have two official 65ltr plastic storage bins and several ‘unofficial’ spots, WiP bags, temporary boxes and bags… I have bought some more storage boxes so hopefully I’ll be able to split it down into something a bit more ‘findable’ – update to follow!